With what appears to be the real culprit behind Sunday’s big Oscars mix-up revealed, it’s time to start filling in the gossipy behind-the-scenes details that will make for thrilling drama whenever this is made into its own movie. Naturally, the task of filling in gossipy details falls to TMZ, which has a story that adds some juicy wrinkles to the interaction between Faye Dunaway and Warren Beatty as they attempted to present the Best Picture award. 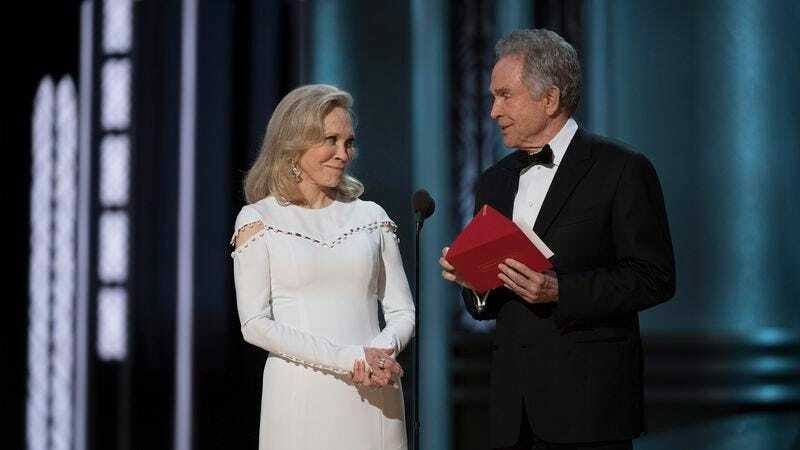 Apparently, Dunaway and Beatty had a bit of an argument during the show’s rehearsal on Saturday, with both of them fighting for the honor of reading the winner of Best Picture. This little feud between them was so vicious that they wouldn’t even walk onstage together, choosing instead to come out separately during the rehearsal, but Beatty eventually gave in and agreed to let Dunaway read the winner. According to TMZ‘s narrative—which is probably more dramatic than what really happened—Beatty saw the wrong card in the envelope and hesitated, prompting Dunaway to reach for the card so he wouldn’t “jack the moment and read it himself.” Then she read it, announcing the wrong winner of Best Picture, and Beatty didn’t say anything because of this bad blood between them from the rehearsal. Basically, both famous people are the villains in the story, which is exactly the kind of narrative that TMZ would love to push, but at this point there’s no way to tell if it was really an honest mistake or if both Dunaway and Beatty were looking to grab the spotlight and make the other look bad. Whatever the truth is, they both probably wish they hadn’t been involved in this at all.